Are you interested in bringing a social and emotional learning programme to your school? We are currently the only certified MindUP™ facilitators in Ireland. MindSETs training was established in 2016 to meet the growing demand for Social and Emotional Learning (SEL) programmes in Ireland. With over 35 years of experience in the Irish education sector and a passion to see SEL programmes reach Irish children at the earliest stage of their education, MindSET trainers Steve Lane and Breda Kyne offer a range of programmes designed to meet your specific needs. From bespoke one-off training sessions to the scientifically accredited programme MindUP™ our training sessions offer an insight into how understanding the brain and changing your mindset can foster a positive culture in your school or organisation. 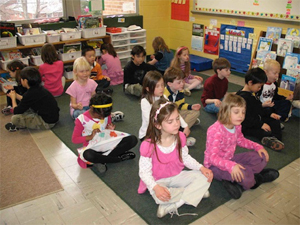 Social and Emotional Learning (SEL) programmes teach children social and emotional skills that are not only linked with greater academic success but also skills of empathy, compassion, kindness, gratitude, optimism and resilience which improve their relationships and ability to make responsible decisions and choices within the school and wider community. SEL programmes also improve student attitudes toward school and reduce stress for both students and teachers alike. Traditionally there has been an assumption that academic learning has little or nothing to do with our emotions or relationships. More recently neuroscience tells us that the opposite is true. The areas of our brain that are involved in cognitive learning are directly linked to the emotional centres of our brain. Whenever a child experiences a distressing emotion eg fear or anger, their ability to hear or understand what a teacher is saying is temporarily restricted. The body is flooded with adrenaline and cortisol as their ‘flight or flight’ survival instinct kicks in. In ‘survival mode’ the need to evaluate, problem solve or retain new information is restricted. The opposite is also true. When a child feels calm and focused, the cognitive areas of their brain are open and ready to learn. Neuroscience clearly tells us that there is a direct link between emotions and learning and that happy children are more effective learners. MindUP™ is grounded in neuroscience, activated by mindful awareness, inspired by positive psychology and is a catalyst for social emotional learning. MindUP™ is composed of a framework of 15 lessons. Students learn about their brain, how to self regulate their behaviour and mindfully engage in focused concentration required for academic success. MindUP™ aims to build resilience, reduce stress and anxiety. As children develop an understanding of the brain science linking emotions, thoughts and behaviours, they apply this knowledge and understanding to managing their own emotions and behaviour. They develop greater empathy for others and are more optimistic and happy.